About: A silent walk through our beautiful classrooms and discussion on Friday evening is the perfect preparation for your morning as a Montessori student. Begin in Toddler House and continue through Children’s House (as a three- to six-year-old), Lower Elementary (as a first through third grader), and Upper Elementary (as a fourth through sixth grader). Enjoy hands-on exploration of Montessori materials and lessons with fellow parents who are also parading as Montessori students for the day. 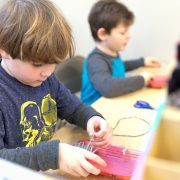 When: Friday, November 9 from 6:30-8 p.m. and Saturday, November 10 from 8 a.m.-1 p.m.
Why: Gain an in-depth understanding of Montessori and discover the continuity of the curriculum throughout the levels.